Too often, “teacher leadership” roles intended to attract and retain teachers—especially great ones—and close student learning gaps fail to produce the intended impact. 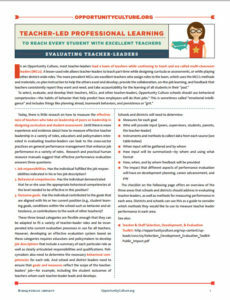 This two-page brief offers a quick list of the common pitfalls of designing such roles, and a chart of the 12 essential factors for creating high-quality, lasting teacher-leader roles. Defining and organizing high-impact teacher-leader roles can allow great teachers to have a far greater effect on vastly more students and teaching peers. This set of slide decks for 19 training sessions for new multi-classroom leaders, with accompanying handouts, is based on input from the first Opportunity Culture multi-classroom leaders about the information and training they needed to be successful in leading their teams. This research synthesis, Designing Effective Professional Development Experiences: What Do We Know?, was written for the John Edward Porter Professional Development Center at the North Central Regional Educational Laboratory as a resource for schools and districts to help them design more effective professional development experiences for teachers. Examining the research base to date, this synthesis identifies certain characteristics of professional development activities that influence whether or not participants achieve their stated goals. Written by Emily Ayscue Hassel, and published by North Central Regional Education Laboratory in 1999, this toolkit takes the best practices of award-winning schools and organizes them into a step-by-step planner for designing and implementing professional development. Lucy Steiner designed this workshop to enable district officials in Columbia, South Carolina to design professional development experiences for teachers that increase student learning. The presentation provides step-by-step guidance on how to analyze existing performance data, identify goals for student and teacher learning, select and implement effective professional development activities, and evaluate impact.